When you get hungry during your visit to Yesterland, head over to the Silver Banjo Barbecue for some delicious barbecued spareribs. You'd rather eat fish? Then enjoy some fish and chips with barbecue sauce -- or tarter sauce if you prefer. It's not a coincidence that the proprietor of this establishment reminds you of Thorny, the Nelsons' affable neighbor on TV's "The Adventures of Ozzie and Harriet." It's Don DeFore, star of television, movies, and Broadway. The Silver Banjo Barbecue is located right next door to the Aunt Jemima Pancake House where you might see another celebrity -- friendly Aunt Jemima. Manager Verne DeFore and proprietor Don DeFore invite to come on in. 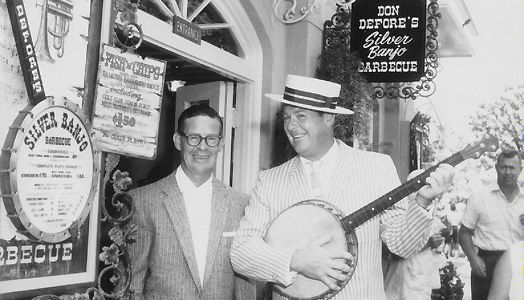 In Disneyland, Don DeFore's Silver Banjo Barbecue opened in 1957, taking over the space that had previously been the original home of Casa de Fritos. The Silver Banjo Barbecue closed in 1961 to allow expansion of the neighboring Aunt Jemima Pancake House. 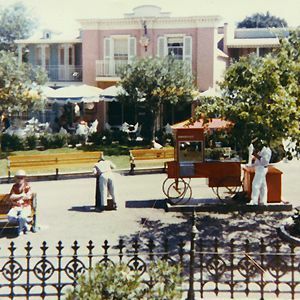 With subsequent name changes and remodeling, the restaurant became Aunt Jemima's Kitchen, the Magnolia Tree Terrace, and now the River Belle Terrace. "New Orleans Street" on the postcard below referred to an area of Frontierland (near Adventureland) with wrought iron balconies in the style of New Orleans, not to New Orleans Square which opened in 1966. Click Here for much more Silver Banjo memorabilia at Daveland web site. 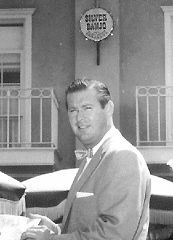 Don DeFore is best known to baby boomers and rerun fans as "Thorny" Thornberry on The Adventures of Ozzie and Harriett and as George "Mr. B" Baxter on Hazel, for which he received an Emmy nomination. His distinguished acting career includes over 90 movies including The Stork Club (1945) with Betty Hutton; Thirty Seconds Over Tokyo (1944) with Spencer Tracy, Van Johnson, and Robert Walker; and My Friend Irma (1949) with Dean Martin and Jerry Lewis. Thanks to Werner Weiss for assembling this page. His complete Yesterland web site is a wonderful tale of the way the park used to be. All photographs of Don DeFore's Silver Banjo Restaurant are courtesy of Ron DeFore, son of Don DeFore, from the DeFore family collection. 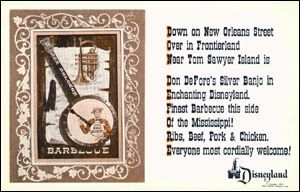 Disneyland Silver Banjo Barbecue postcard, Copyright 1957 Walt Disney Productions, from the DeFore family collection. The caption in the upper right corner of this page is a parody of the the caption of Silver Banjo postcard.